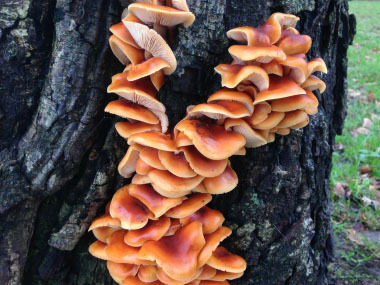 Overview: Velvet Shank are often seen fruiting throughout light snowfall and is even known to continue growth after it has thawed from freezing. 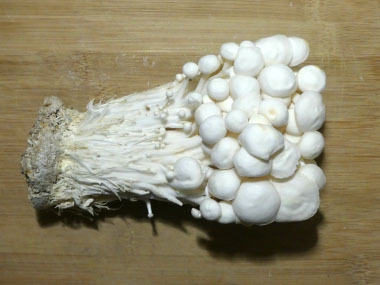 These mushrooms are the wild alternative to the cultivated form, enoki. 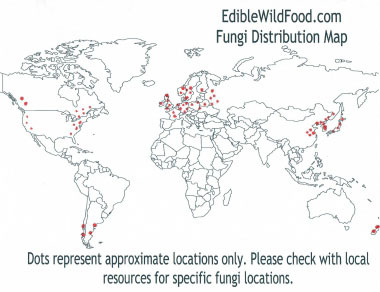 Enoki mushrooms are found in grocery stores and are also called enokitake. 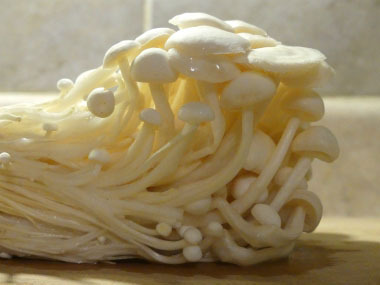 Enoki is white, long-stemmed, and tiny-capped (image appears in the images). 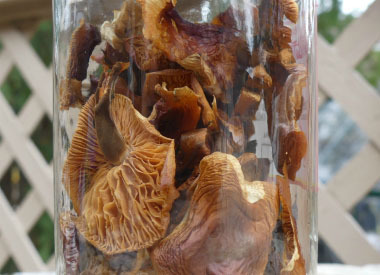 Extracts from this mushroom show exceptionally high anti-cancer activity, and an epidemiology survey of Flammulina velutipes farmers in Japan found that the mushroom farmers had lower rates of cancer deaths than people who were not involved in mushroom farming. Distinguishing Features: The cap measures 1 to 7 cm. (.39 to 2.75”) ; is convex, becoming broadly convex to flat. 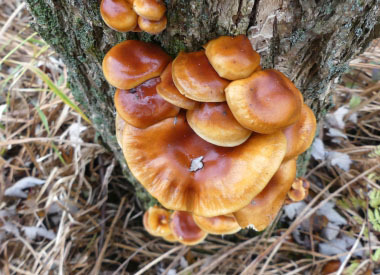 It is moist and somewhat sticky when fresh and the colour can vary from dark orange brown to yellowish brown. Stems measure 2 to 11 cm. (.79 to 2.75”) long; 3 to 10 mm thick; and are equal or larger towards the base. They are tough; pale to yellowish brown (or orangy-brown when young) and as they mature, the stems become covered with a dark, rusty brown to blackish velvety coat. Height: 2 to 11 cm. (.79 to 2.75”). 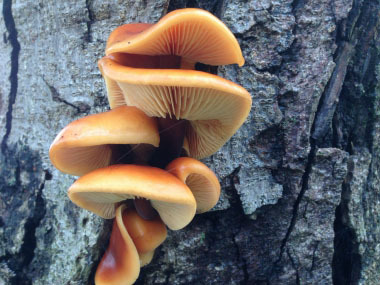 Habitat: Velvet Shank mushrooms are saprobic on stumps and trunks of dead hardwood trees, especially ash, elm, oaks, willow and beech trees. They are occasionally found on diseased living trees. Season: Early autumn to late winter depending on location. When the colder weather moves in, this mushroom provides a forager with something to look for. 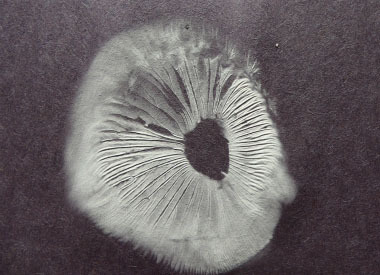 In fact, this mushroom is usually in season from November to March in Great Britain. 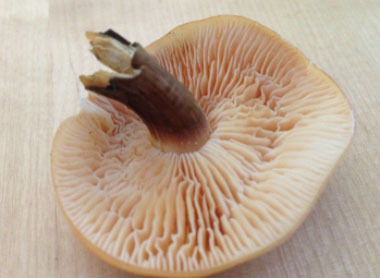 Edibility: Stems are generally too tough for eating but the caps can be used in soups, stews, as well as in casseroles. They must always be cooked. It is believed to remove the skin of the cap before cooking as it is supposedly not easily digested. 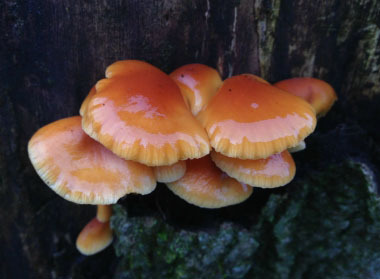 These mushrooms are considered tasty, with a sweet, mealy flavour. Enoki stems and caps are edible and have a pleasant taste. A big thank you goes out to Poppy of WildFoodUK, who provided EdibleWildFood.com with the velvet shank images to make this post possible. Thank you Poppy – your kindness is greatly appreciated. Be sure to follow WildFoodUK at Facebook.